Who better to advise an athlete on treating a sports hernia than fifteen-time Ironman finisher and hernia specialist, Dr. David Albin, who has performed 12,000+ hernia surgeries and has over 25 years experience. 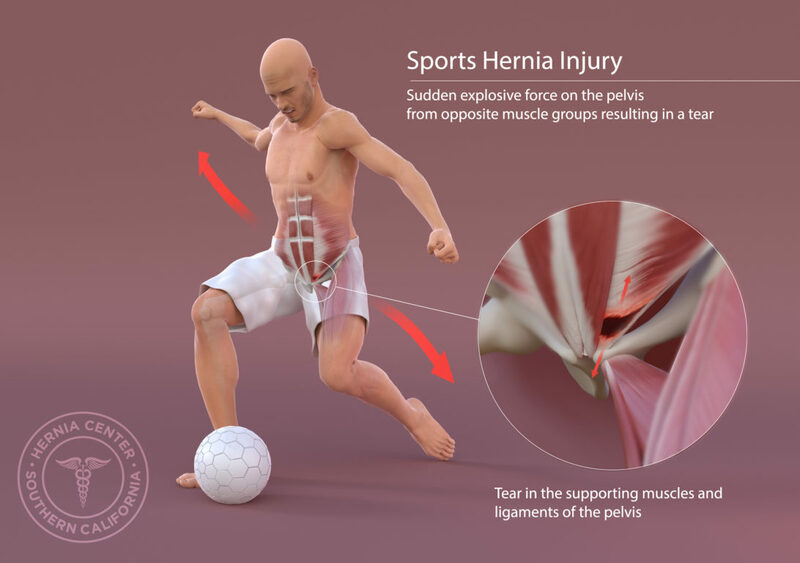 A sports hernia, medically known as athletic pubalgia, occurs when the lower abdomen muscles are strained to a point where they tear or rip, causing pain in the lower abdomen and groin area. In this type of injury the pain usually begins slowly, then increases in intensity with time. Sports hernias occur in both professional and recreational athletes. While it is mostly men who sustain sports hernias, women can also incur them. Even athletes with strong abdominal muscles are subject to sports hernias. This is because they usually do not happen all at once. Rather they develop gradually through shearing forces, created by simultaneous contracting of the abdominal wall, and thigh muscles pulling in different directions. This occurs more commonly during side-to-side movements resulting in small tears or rips in the muscle that exacerbate until they become a more serious problem. A sports hernia is often confused with and misdiagnosed as a groin strain. A strain will usually heal on its own in two to six weeks. A sports hernia is differentiated from the classic inguinal hernia in that there is no observable hernia bulge, and in some cases recovery will require surgery. Diagnosis is determined by the patient’s health history and a physical examination. Tests may be performed to rule out other causes for the groin pain. An MRI can be used to detect a sports hernia, but it’s not always positive. More often, simple methods will tell, such as having the patient to perform an activity like sit-ups or a straight leg lift. If the patient’s pain intensifies during these movements, it’s likely a sports hernia is the culprit. Pain or tenderness located over the pubic tubercle. Pain or tenderness located over the upper inner thigh muscles. Groin pain exacerbated by exercise. Ongoing tenderness in the groin. Pain from a sports hernia generally begins slowly with an ache in the lower abdomen and/or groin region. The pain is usually on one side of the abdomen. The pain worsens with sudden movements such as kicking, sprinting, twisting, and high level of activity. Rest is the number one treatment for a sports hernia. It is usually partnered with applying an ice pack to the injured area 3 to 4 times a day for 20 to 30 minute periods; and taking anti-inflammatory medicines such as Motrin® or Aleve®. It can take anywhere from a few weeks to a few months for the symptoms to go away. However, the longer you continue participating in the causal activity the longer it is going to take you to heal. If the aforementioned treatments do not alleviate the symptoms of a sports hernia, surgery may be needed to repair the weakened abdominal wall. The operation of choice is an inguinal hernia repair. Dr. Albin believes that each athlete needs to be treated individually. For example, the sports hernia surgery for a professional linebacker or a weightlifter will differ from the type of hernia surgery for a sprinter or cyclist. Our sports hernia operations take into account the specific needs for each athletes, and are tailored accordingly. 1.​ Sports hernias can be treated by three different options. The open hernia operation with mesh is the first preference of Drs. David and Michael Albin. 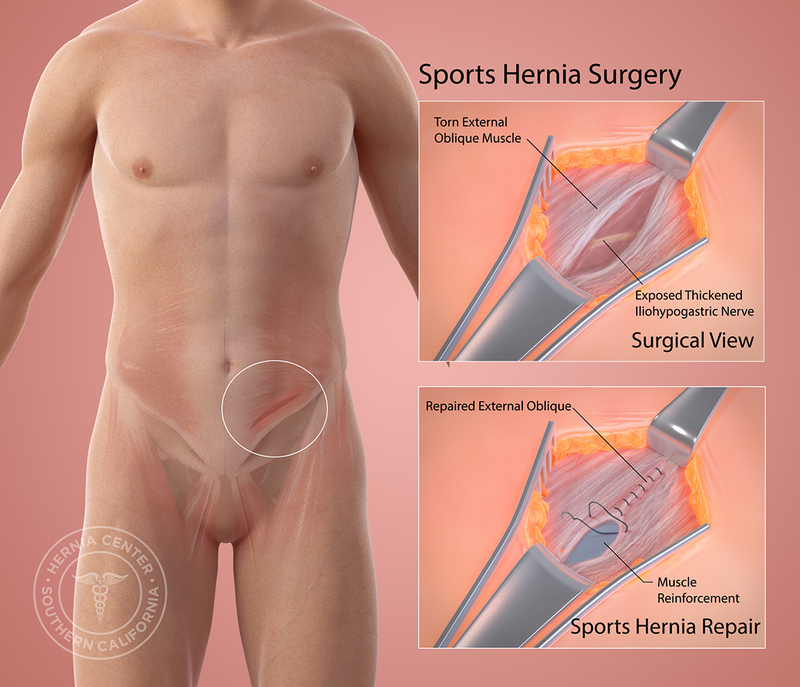 In fact, most hernia specialists throughout the world treat sports hernias using the open technique with mesh placement. The open hernia operation without mesh and the laparoscopic method are acceptable treatments although they have certain faults.The open procedure performed by Drs. David and Michael Albin allows first a full evaluation, and then a secure repair of the damaged muscles. Hernia surgery is generally performed on our professional athletes while they are awake under local anesthesia so that we are able to pinpoint and correct the precise area of concern. Mesh is used because it has proven to be the strongest repair with the lowest rate of reoccurrence. There are three nerves in the inguinal region. With open surgery, the groin nerves are easily seen, evaluated and treated. They are also examined for signs of inflammation or entrapment. Involved nerves are divided. This leaves a small area of numbness but most importantly it eliminates the pain. 2.​ Some older surgeons repair hernias the old-fashioned way, without using mesh, because they do not have experience in the more recent mesh placement. The problem is that this non-mesh method, using sutures only, isn’t as strong as the mesh repair. Non-mesh is more likely to rupture. At the Hernia Center of Southern California, we have repaired many such recurrences, due to the non-mesh technique used by other surgeons. The non-mesh method may work for the athlete involved in a light sport such as tennis, running, or golf. However, if the athlete decides later in life to take up a more demanding sport, such as weightlifting, the non-mesh repair most likely will fail under the pressure of heavy lifting. 3.​ The laparoscopic method involves placing a mesh behind the muscles. The nerves cannot be treated during this procedure because they can’t be seen. We perform laparoscopic hernia surgery at the Hernia Center of Southern California under certain conditions, but not as a treatment for sports hernia. Adductor longus tendon injuries are typically referred to an orthopedic surgeon. Some patients will obtain relief with an injection of steroids. Recently the most up-to-date orthopedic surgeons insert a PRP injection (platelet-rich plasma) which uses the patient’s own blood as another method of therapy. On occasion the tendon may need to be surgically repaired. Every one of our patients receives an individualized rehabilitation program that is catered to their specific needs. Studies have shown that between 65% and 90% of athletes who undergo surgery are able to return to their regular athletic activity within about six weeks. DISCLAMER: The following schedules constitute a general return-to-activities for patients who’ve had the Albin Tension Free Mesh technique. Your regimen may be slightly different. After surgery, Dr. Albin personally consults with each patient and individually initiates a rehab program depending on the patient’s healing and skill level. One day after sports hernia surgery we recommend walking for one hour per day. After two to three days, this is increased to two hours per day. Once patients are walking without any discomfort, then running is initiated. Running activities are performed in five minute intervals. Patients can run for 20 to 40 minutes, or four to eight intervals of five minutes each, depending on their comfort or skill level. Day one: First week of jogging consists of five minute intervals. A light jogging interval is performed for only one minute followed by four minutes of walking. Day three: Light jogging interval for two minutes followed by three minutes of walking. Day five: Light jogging interval for three minutes followed by two minutes of walking. Day seven: Light jogging interval for four minutes followed by one minute of walking. WEEK 4: Normal running pace. WEEK 5: No restrictions. Speed work or hills can be added without restriction. One day after sports hernia surgery we recommend walking for one hour per day. After two to three days, this is increased to two hours per day. Day seven: Begin slow swimming with exaggerated strokes that mimic stretches. Day ten: (to day 14, depending on your comfort level) Begin slow or recovery type swimming, gradually increasing up to one hour. Salt water swimming can also begin day ten. WEEK 3: Begin aerobic swimming and drill work, all at a moderate pace. WEEK 5: Initiate speed work and swim without restriction. One day after surgery we recommend walking for one hour per day. After two to three days, this is increased to two hours per day. Day three: Begin cycling on a stationary bike. Start at a slow low intensity or pace for the first week. Begin with no more than 30 minutes the first day. Cycle every day. Gradually increase the time, up to one hour. We prefer use of the stationary bike the first week to avoid falls. WEEK 2: Bike on a non-stationary bike. For this week we recommend flat terrain. Make your first outdoor bike ride a small loop, such as around the block, in the event you find you’re not quite ready yet. Gradually, as your comfort level improves, you can add more time and distance on the bike. WEEK 3: Add some hill work. WEEK 4: Add speed work and cycle without restriction. Day five: Make your first trip to the gym. Use light free weights or machines at minimal tension. This is done to maintain your flexibility. You should not lift over forty pounds the first month. We recommend that you use your personal toning weight as a guide. WEEK 4: Lift 25% of your toning weight. WEEK 5: Lift 50% of your toning weight. WEEK 6: Lift 75% of your toning weight. WEEK 7: Lift your toning weight. WEEK 8: Lift without restriction. Day three: Begin putting and chipping. Day five: You may be ready for a pitch and putt, or a par 3 course. Restrict yourself to irons greater than number seven. If you want to use the driving range you may do so, but stick to your short game. Favor the higher number irons. WEEK 2: Start hitting a few of the heavier irons. By week’s end you can increase your use of the lower numbered irons. WEEK 3: Add the woods. You may be ready for a 9-hole or executive golf course game. WEEK 4: Play a full 18-hole game without restriction. One day after your sports hernia surgery we recommend walking for one hour per day. After two to three days, this is increased to two hours per day. In all initial situations, hike sensibly. Always let someone know where you are going. Bring an ample amount of water. Stay on the trail. Day three: Begin hiking on flat terrain. Start with a short, easy hike. You may gradually increase the distance, but be guided by your comfort level. And do not “go the extra mile”. WEEK 2: Begin with short, moderate hikes or long, easy hikes. WEEK 3: Begin long, moderate hikes. WEEK 4: Begin strenuous hikes. Day three: Start shooting hoops by yourself. WEEK 1: Play a one-on-one game with an easy opponent. WEEK 2: Play full court, but plan on sitting out most of the game. WEEK 3: You can play a good portion of the game. WEEK 4: Pay full court without restriction. Day five: Start hitting some balls – either against a wall, or play with an opponent who will hit the ball to you. It is not advised that you run after the ball at this time. WEEK 2: Play an easy doubles game, or a singles game with minimal running. WEEK 3: Play without restriction. FOUR WEEKS after hernia surgery: You can return to any and all recreational and athletic activity (except weightlifting), including contact sports. By this time in the recovery process you’ll be able to perform all original activity the same as you did before surgery. If you are still experiencing some discomfort, this is normal. However, if you experience sharp pain at this point in the recovery process, please contact your doctor as soon as possible. Dr. Albin strongly recommends that all athletes, no matter what the sport, regularly practice exercises which increase flexibility and strengthen pelvic muscles regularly so as to avoid sports hernias altogether. And never jump right into your game or sport; always do a warm-up first. The Hernia Center of Southern California has helped thousands of high profile professional athletes, college athletes, and recreational athletes. Dr. Albin is a highly recognized expert in sports hernia repair. The Hernia Center of Southern California specializes in all types of advanced open and laparoscopic hernia surgery. Dr. Albin has performed over 12,000 hernia surgeries in 25 years. His surgical practice is focused solely on the diagnosis and treatment of hernias. He is exclusively a hernia surgeon. Patients come to Dr. Albin not only locally from Los Angeles, Orange County, Riverside, San Bernardino and San Diego counties, but throughout the United States and even overseas. The Albin Tension Free Mesh Technique is recognized worldwide. Feeling pain? Call us today to schedule an appointment.